Do you realize why you need a plastic bag sealer? Are you fed up with shampoo leaking in your luggage? Does your fridge smell of the fish you are waiting to cook? 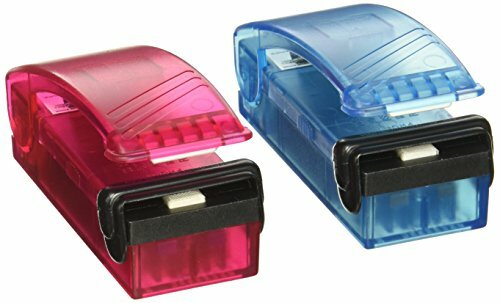 This 2-pack plastic bag sealer has so many uses and has a marginal ecological benefit because you will be buying a heck of a lot fewer freezer bags. Airtight seal in seconds to lock in flavour and freshness. If you are a dieter then you know you need this to stop your feeble excuses that you have to finish the snack because they’ll be stale tomorrow. Excuse no more just reseal the bag and they’ll be fresh for the next snack urge with half the calories. Simple to use just clamp the unit across the top of the bag and slide it along to seal it back up. Bought some frozen Brussel sprouts but won’t cook them all – reseal the freezer bag they came in and stuff them back in the freezer. Seal up your makeup, toothpaste and contact lens solution and pack it in your luggage to avoid the check liquid volume limits yet be sure it won’t leak out all over your holiday gear. Instant food saver bags, instant freezer bags, instant travel bags and a pretty good alternative to expensive vacuum bag sealer bags. I use it for the marinade! A quick tip – read the instruction manual! The plastic bag sealer needs a few seconds to heat up before use. Also, some plastics are thicker than others and materials differ. This means you need to move the plastic bag sealer more slowly for thicker bags or bags made of plastic that needs a higher temperature to soften and seal. Keeps your food fresh or your phone dry and does many other things. It can completely seal or reseal a bag easily. Pretty cheap and is not easy to malfunction or break. Quite small so you can carry it around everywhere you go.